The Cumberland & Dumfriesshire Farmers Mart PLC had forward 804 head at their Annual Ram Fair at Longtown on Wednesday 5th October 2011. 67 Cross Bred Rams, 320 Texel Rams, 62 Charollais & Continental Rams and 106 Suffolk Rams were presented in Ring 1, with trade being buoyant throughout to a full ring of buyers and Suffolks & Charollais being in particular demand. Best Texels were also easily sold and quality was the best seen in years! Included the day was the Annual Show and Sale of Texel Rams and Ram Lambs, ably judged by Mr Dean Aitken, Uppercleuch, and kindly Sponsored by Trojan 4 x 4, Linstock, Carlisle. The Championship was awarded to a Ram Lamb from Messrs Tough, Easterseat, Carluke, which went on to realise £1,000, selling to the judge. The Reserve Champion was a Shearling from Messrs Robertson, Becks, Langholm, which realised £500 to A. McCreadie, Uppertofts. 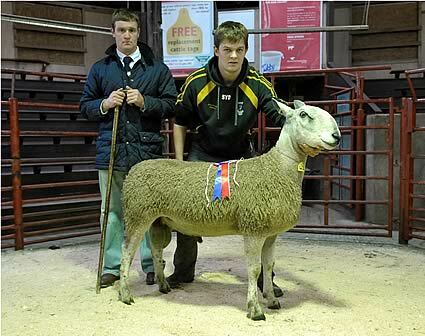 Shearling ram:- 1st Prize and Reserve – Messrs Robertson, Becks, £500 to Uppertofts. 2nd Prize– Kirkton, £1,100 to D’Mainholm. 3rd Prize – Becks, £720 to Becton Hall. 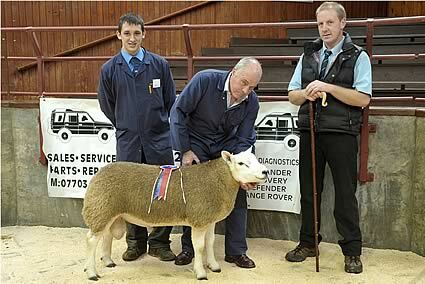 Ram lamb:- 1st Prize and Champion – Easterseat £1,000 to Upper Cleuch. 2nd Prize – Little Galla (not sold). 3rd Prize – Easterseat £320 to Sherra Craig. Shearlings - £1,100 (x2), £1,080, £1,000 Kirkton, £920 Kilnfordcroft, £800 Falla and Kirkton, £720 Becks, £580 Uppercleuch, £520 Falla and Greenknowe. Ram lambs - £1,000, £450, £380 Easterseat, £280 Sandilands, £260 Chesterhall, £240 Sandilands. Also held was the inaugural Show for Suffolk Rams, ably judged by Mr T. Armstrong, Sceughdyke, who awarded the Championship to a Suffolk Ram Lamb from Messrs Martindale, Land Farm, which later realised £520 to the judge. The reserve was a Shearling Ram from Messrs Roots, Kilnfordcroft, realising £540 to Messrs Blaylock, Hallburn. Shearling ram:- 1st Prize and Reserve – Kilnfordcroft, £540 to Hallburn. 2nd Prize– Kinning Hall, £600 to Hallburn. Ram lamb:- 1st Prize and Champion – Lands £520 Sceughdyke. 2nd Prize – Lands, £600, Carruthers. 3rd Prize – Prettsmill £340 to Linglie. Shearlings - £650 Kinning Hall, £600 The Land and Kinning Hall, £560 (x2) Kinning Hall, £540 Kilnfordcroft, £520 Skelfhill. Ram lambs - £600, £480, £450, £440, £420 The Land. Other Rams:- Charollais sold to £750 for a Shearling from Messrs Wales, Thackwood and to £420 for a Lamb from Mrs Luescher, The Kerr. Beltex sold to £520 (x2) from Messrs Currie, South Corbelly. Crossbred Shearlings sold to £460 for a Texel x Beltex from Uppercleuch. Charollais x Beltex shearling £420 Thackwood. Blue Texel lambs to £250 Millside. Bleu d’Maine £300 Ormiston Lodge. Charollais - £750, £500, £450, £440 Thackwood, £440 Wester Parkgate, £400 (x2) Thackwood. Beltex - £520 (x2) South Corbelly. Texel x Beltex - £460 Uppercleuch. Charollais x Beltex - £420, £400 Thackwood, £400 Broom Isle. Charollais £420 The Kerr, £400, £380, £360, £350, £340 Springfield. Blue Texel - £250 Millside. The Annual Show & Sale of non-registered Blue Faced Leicester Rams, Ram Lambs and Females saw 202 head forward. With a full ring of buyers in attendance from as far away as Devon and Wales, trade was buoyant throughout with a near total clearance being attained. Top price outwith the show was £920 for a strong Shearling from Wanwood Partners (Cowden), Wanwood Hill, Alston. Judging was efficiently carried out by Tristan Davidson, Bellmount, Irthington, whose awards were as follows. £700, he also received the G.E. Carter & Son Silver Challenge Trophy. 2nd Prize – Derek Henderson, Low Struthers, Allendale, sold at £600. and sold at £600, he also received the Robert Telford Memorial Trophy. 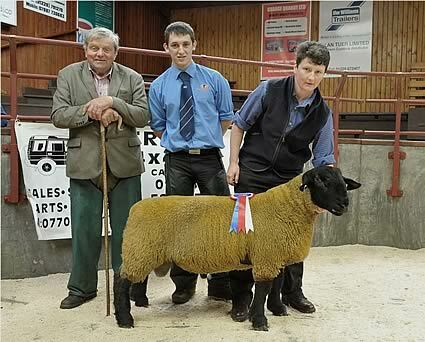 2nd Prize – Messrs Walton, Penpeugh, Bardon Mill, Hexham, sold at £500. Rams 2 shear and over- £650 Union Road, £500 Peela Hill. Shearlings - £920 Wanwood Hill, £800 Peela Hill, £700 Parkhill, £600 Low Struthers, £540 Wanwood Hill, £500 Tecket and The Side. Ram lambs - £600 Rainbow Cottage, £500 Penpeugh, £420 Collinbank, £400 Troutbeck Cottage, £380 Raggetsyke. Females - £160, £140 Parcelstown.